Loviisa is a municipality and town of inhabitants on the southern coast of Finland. Linden Esplanade and Saint Peter and Saint Paul Cathedral are good opportunities to explore the local culture. You'll discover tucked-away gems like Bunker Museum and Arboretum Mustila. 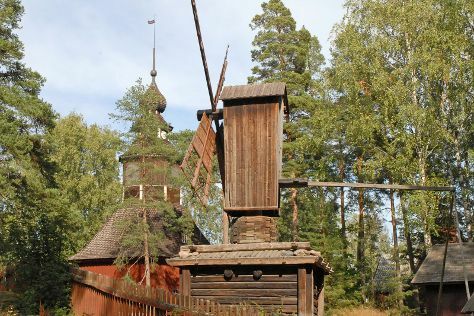 You'll find plenty of places to visit near Loviisa: Salpa Line Museum (in Miehikkala), Hamina (St. John's Church, Marian Kirkko, & more) and Kotka (Santalahti Nature Trail, Kotka Church, & more). There's still lots to do: take in the architecture and atmosphere at Pyhtaa Church of Saint Henry. For reviews, where to stay, and tourist information, go to the Loviisa trip itinerary maker website . Detroit, USA to Loviisa is an approximately 18-hour flight. The time zone difference moving from Eastern Standard Time (EST) to Eastern European Time (EET) is 7 hours. Traveling from Detroit in March, expect nights in Loviisa to be about the same, around 23°F, while days are a bit cooler, around 35°F. Cap off your sightseeing on the 14th (Thu) early enough to travel to Helsinki. You'll discover tucked-away gems like Teijo national park and Bellevue Beach. Do some cultural sightseeing at Seurasaari Island and Open-Air Museum and Natural History Museum (Luonnontieteellinen Museo). Explore the numerous day-trip ideas around Helsinki: Fagervik Museum (in Inkoo), Tulliniemi Nature Path (in Hanko) and Ekenas Archipelago National Park (in Raseborg). Spend the 20th (Wed) exploring nature at Sipoonkorven Kansallispuisto. Spend the 21st (Thu) exploring nature at Nuuksio National Park. The adventure continues: explore the world behind art at Kansallisgalleria, play a few rounds at Tapiola Golf, wander the streets of Katajanokka, and indulge your thirst for a good beer at Mathildedalin Kylapanimo. To see other places to visit, photos, and tourist information, you can read our Helsinki trip planner. Drive from Loviisa to Helsinki in 1.5 hours. In March, daytime highs in Helsinki are 37°F, while nighttime lows are 23°F. Finish your sightseeing early on the 23rd (Sat) to allow enough time to travel back home.